Is it time for you to dive deeply into your own soul? Do you need help rising up and breaking barriers that are holding you back? 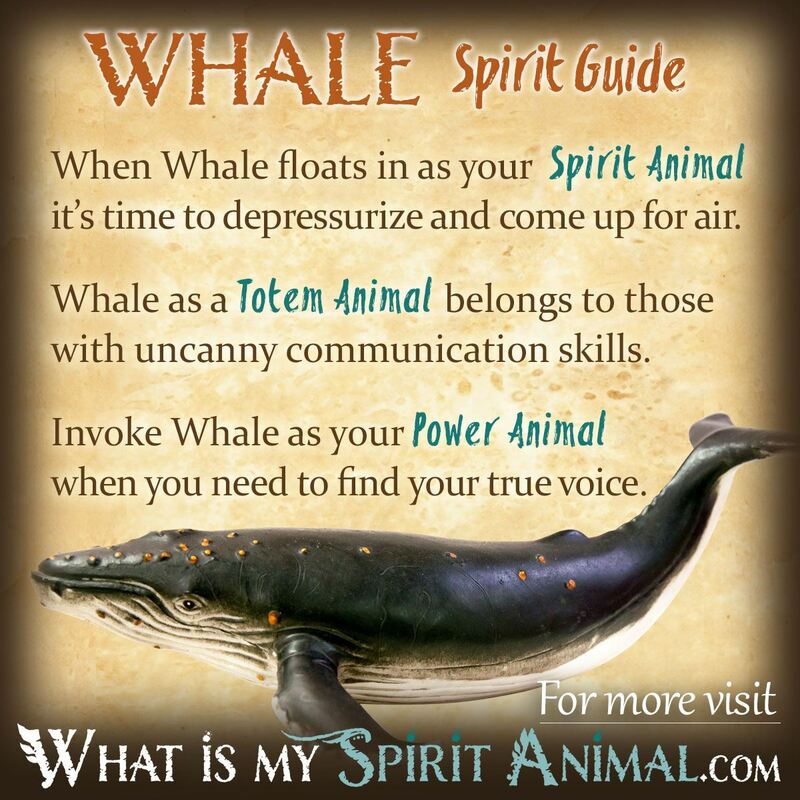 Whale as a Spirit, Totem, and Power Animal can help! Whale teaches how to begin navigating the tumultuous currents of life and how to harness the courage to sing your personal song? Delve deeply in Whale symbolism and meaning to find out how this animal spirit guide can support, assist, and inspire you. This graceful giant of the ocean has inspired awe around the world, and rightfully so. The sight of a Whale breaching the water or frolicking in the foam moves the most stoic of person to wonderment. Lightworkers tell us that Whale Spirit records the earth’s history from all corners of creation. For seekers this means that Whale energy aids in tapping our ancestral DNA and unlock the mysteries that lie there. Whale also lifts our spirits, swimming through the spheres to reach the Akashic records and open the book of self, particularly for understanding our emotions and what affects them deeply. As Whale enters your life you’ll find self-examination becomes the “norm”. You may need to retreat and contemplate alone, honing in like Whale sonar, so you can really hear your inner voice, the Whale’s Song, the Higher Self and the Divine. Ask yourself; are you where you need to be? Are you in toxic waters? Is the ocean tumultuous? If so, take hold of the Whale’s Tail with confidence and let Him move you to safety. In the Biblical story of Jonah, Whale becomes a redeemer, sacred teacher and transformer. She is the instrument of Jonah’s rebirth and spiritual awakening. Just like Jonah, Whale calls us to wake up and realize that there is more to our reality than what we know through our physical senses. Traveling with the Whale beneath the waters of our consciousness opens another world in our awareness. Psychic attentiveness bursts forth when Whale surfaces again and we take that first breath together. Angelic presences, playful Devas and doorways to other spheres become more evident. The grandness of Whale symbolism and meaning cannot be denied. As a spiritual guide there may be times when Whale’s powerful nature upsets your boat so that you can get out of a rut. This won’t be a gentle ride, but you will not go under. Whale medicine gives lessons compassionately, seeing this change as necessary for your growth and renewed creativity. Many sages regard seeing a swimming Whale as a sign of Divine blessing and luck. In Arctic regions Whale is regarded as a “perfect creature” and one that deserves respect. Even with the amazing speed and strength of Whale Spirit, He remains sensitive to humans in distress. Whale offers us the safety of His back as a bridge between us and the animal world, particularly water-dwelling creatures. These associations may well be the reason that many ocean societies have adopted Whale Tail charms, wearing them for the Whale’s magical protection and fortune. When Whale arrives as your Spirit Animal, it’s often during a time of emotional or physical duress in which you’ve lost your sense of self. In fact, Whale is the ideal Spirit Animal for such times. Consider how Whales withstand the pressure of the ocean, but never stays down too long. Come time to breathe, Whale bursts joyfully forth, accepting that renewing air! This is the gift Whale offers – the ability to “cope” and function in highly pressurized situations until you can come up for air and reclaim your inspiration and clarity. Another aptitude Whale provides is an intimate sense of biorhythms on more than just a physical level. When you still yourself and listen to the beating of your heart – that life-giving rhythm is like the identifying sounds Whale uses to identify their pod in nature. Whale asks: what does your heart tell you? If you have Whale as a Totem Animal, you are someone who is excellent with refined communicating over long distances even as Whale does under water. Frequently this communication focuses on your inner circle because Whale has strong family ties that He honors fervently. Your friends and loved ones know they can depend on you for the truth, particularly when others are blinded by emotion or have given away their power. The Whale Totem within provides you with intense awareness of things beyond this realm. The collective unconscious and cosmic awareness is like the Whale’s ocean. You can navigate them and become a bridge between the spheres, travelling on the Whale’s tail. The only caution is you have a natural temptation to spend more time in other worlds. Whale reminds you to return from that other-world ocean and breathe in this reality. Choosing a Whale as a Power Animal means finding your celestial music, your personal song and your true voice. In this melody lies the heart of wholeness, the spirit of compassion and deep insights that previously eluded you. Call on Whale medicine and energy when tracing your family line. The natural aptitude of this Power Animal will help you make connections even over long distances, including the past. As you make discoveries pay attention to what Whale is teaching you about time and space. Whale puts us on notice that we are all connected, not just to each other but to the natural world and through all eternity. As a Power Animal, Whale may charge you with certain tasks – particularly exploring your creativity and learning magical arts. You will not be alone in these efforts for Whale is also a teacher. Just use your song and Whale will joyfully swim right into your aura. Among Native Americans, Whales are considered the guardian of oceans and sea travel. Nearly all coastal tribes have some type of symbolic meanings for Whale Totems and Spirit Animals. Whale symbolism includes wisdom, spiritual awareness, good luck and long lasting love as the Whale mates for life. If you are splashed by one most popular Whales, the Killer Whale, you will be blessed with joy. One story says that the first time a Killer Whale sang all of creation paused to admire its beauty. In Celtic stories the Whale Spirit is associated with St. Brendan, the Navigator. The story goes that he saw a vision of an island, given by an angel. During his endeavors to find this place, the waves became dangerous. A Whale offered its back as a safe haven for Easter service for him and his crew. This is another illustration of the “gentle giant” who provides compassionate service in life’s stormy seas. Dreams about Whales often portend that a time of change ahead. Whale Spirit may shake your foundations so you can build anew. Whales in dreams also speak strongly of our unconscious self and expanding our intuition. Learn more about Whale Spirit by reading Whale Dream Meanings on WhatIsMySpiritAnimal.com! Thank you so much. A beautiful interpretation of a beautiful animal and energy. thanks for the quick image rundown of the whale, high heart love to you! So relevant and sense making. Thankyou. My company name is Whalen Voices. Now I understand more fully why I chose this name (my last name is Whalen, but how fun to have voices added. Thanks so much for this information!!! Deep Thanks and Gratitude for this offering of spirit…:) Love and Light to you! Heartfelt thanks to you for sharing your time, energy, knowledge and wisdom. This means so much to me and many others. Whales come to me in dreams during the loneliest times and I am grateful to learn more about them.